Hire more talent through referral by sharing your company culture! Employee ambassadors have an authentic voice, and their combined social networks reach much farther than the company’s. Impact meets size. And everybody wins. What some companies don’t (yet!) realize, is that employee ambassadorship has an unexpected winner; your recruiting department. 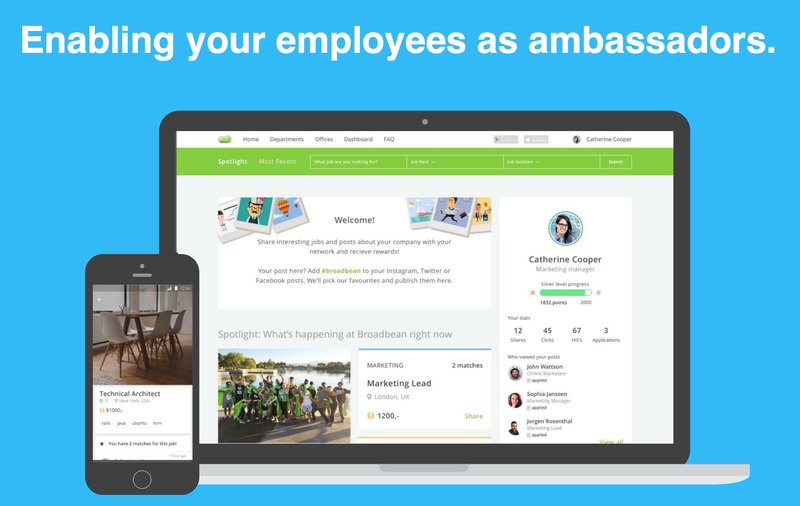 The Ambassador program engages your employees in sharing your employer brand and your jobs. Social Hub. 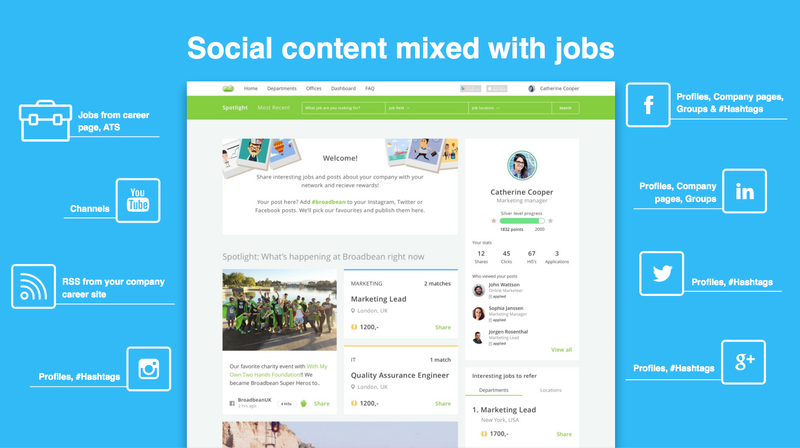 Stream of your social content (from any social network) & jobs in one page. Great way to show job seekers what your culture is about & works as log in page for your employees. Easy to integrate with your career site. Engage employees. Employer branding content has proven to be more interesting to share for employees than only jobs. Maintain a higher level of employee engagement, communicate your employer brand and gain more referrals at the same time. 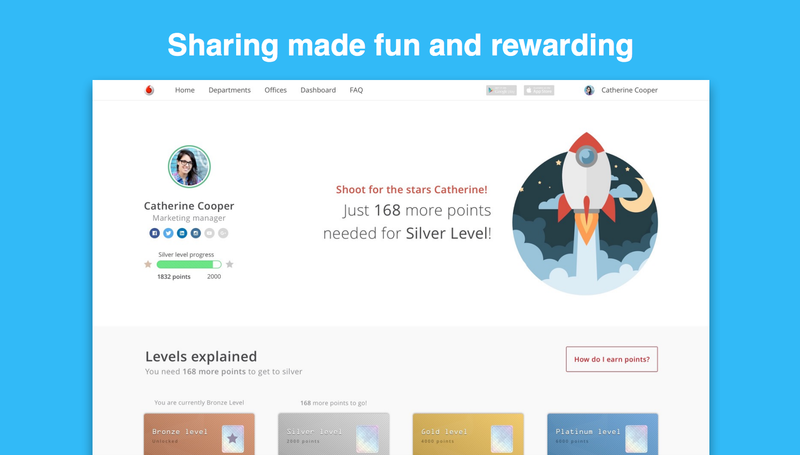 Multiple gamification options are available. Traceable job referral links. 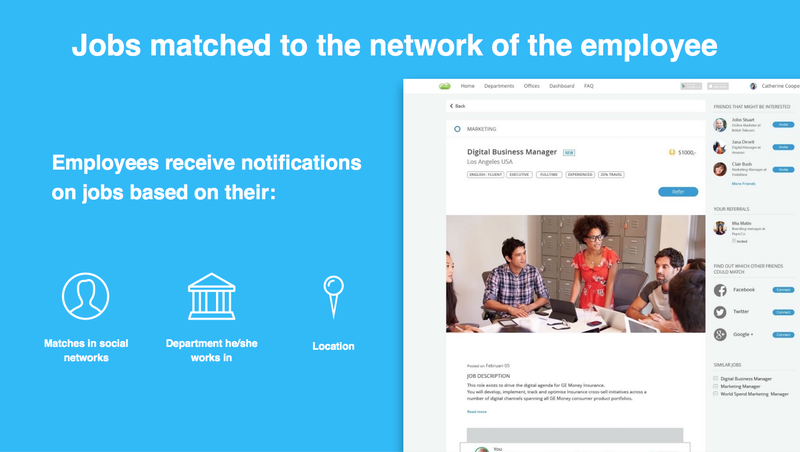 A unique link to the Social Hub is automatically included with every post your employees share on social media. Jobs AND social content attract job seekers. Matching. Employees receive suggestions from their network on open jobs. Track and trace referrals. Seamless integration with Smart Recruiters to make it easy for the recruiters to manage the referral program. Moderation. Easy to use moderation options available. You decide which content is displayed. Create and manage custom feeds based on Users & Hashtags. Hard ROI. Not only do weHire more people through employee referral by sharing your company culture. Analytics. Great analytics that provides in-depth insights in to your program. Setup your ambassadorship program with SocialReferral today and attract the candidates who fit the company culture best, hit Get Started to get contacted by the SmartRecruiters & Careerbuilder staff to learn more! Availability Note: This integration is available for SmartRecruiters Corporate Customers.